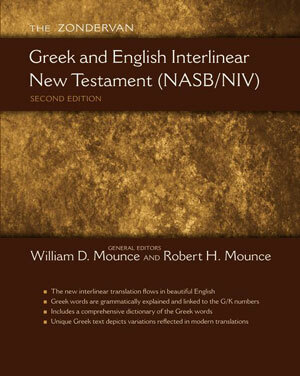 You can purchase the Greek and English Interlinear of the New Testament online from ChristianBook.com or from your local bookstore. Download the Introduction and Philippians. You can also download the Guidelines to the tagging nomenclature. The Zondervan Greek and English Interlinear New Testament (NASB/NIV) now includes an Interlinear translation based on the Greek New Testament. This new, user-friendly reference tool for pastors, students, and scholars greatly enhances understanding of the Greek New Testament, as well as how to do word studies based on the G/K numbers.